..."Eleven Israeli civilians were killed in terrorist attacks since the beginning of the year. More people die in car accidents in Israel on a single weekend. It seems more dangerous than it is. The Arab-Israeli conflict is the biggest problem, but small problems shape the daily lives of Israelis. Unless there happens to be a war going on, the Arab-Israeli conflict is irrelevant in daily life." UPDATED: Does Yair Lapid's Diplomatic Principles Look More or Less like Netanyahu's ? 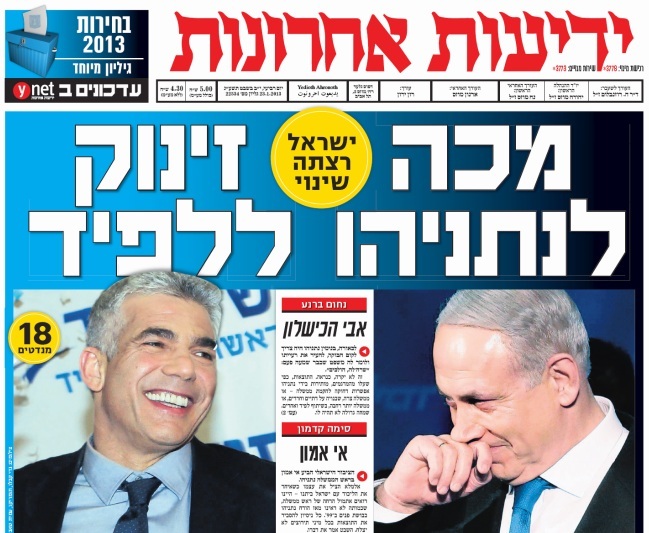 Yair Lapid, who may become Israel's next foreign minister, states in his party's platform that no new settlements will be built during negotiations with the Palestinians, but that settlement growth will be allowed within the needs of the population, which bring Noam Sheizaf to argue that Lapid ain't the left's hope following his stunning victory last Tuesday. 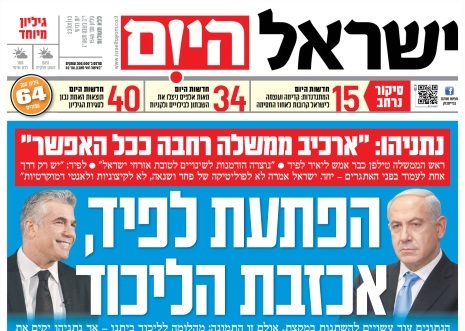 According to Aluf Benn in Haaretz, High-ranking Likud officials claimed over the weekend that Prime Minister Benjamin Netanyahu and his wife, Sara Netanyahu, are seeking to keep Habayit Hayehudi out of the coalition because of personal issues concerning party chairman Naftali Bennett. One confidant toold Haaretz, the Netanyahus lost their trust in Bennett a former chief of staff of Netanyahu and that Sara “issued a veto” against bringing the party into the ruling coalition. Another Netanyahu associate claimed that Netanyahu believes his former bureau chief leaked information to the media on criminal and governmental investigations of the prime minister in several different cases. Naftali Bennett, one of the winners Tuesday night in the Israeli Knesset Elections, seemed to have watched or at least read Barack Obama's 2008 Victory speech. He began his speech with the identical wording Obama gave at the beginning of his victory speech in Chicago Nov. 4 2008, but this was in Hebrew. The King is naked. King Bibi's crown has been snatched away, but he still remains King. If coalition talks go well, and Netanyahu manages to form his 3rd government, he will of had achieved his primary goal of serving as Israel's Prime Minister for a decade long, with a pretty overweight scale of achievements. A weakened Likud Party may indicate Netanyahu has lost his charm or at least the battle this time round, but it does not take too much thought to believe that if his ultimate goal is to put Israel on a path of prosperity, a weakened Likud, which has moved way rightwards, in a stable government is the ideal recipe for a bright end to his political career. Rand Paul Emerging as Pro Israel Advocate: Any Attack on Israel is an Attack on the U.S. Despite of his opposition to Foreign aid, Kentucky Republican Sen. Rand Paul took his most pro-Israel stance yet, in an interview that an attack on Israel should be treated as an attack on the United States. Opinion: Has Netanyahu Become a Weaker Prime Minister? The headlines highlighted in the morning papers where 'Netanyahu got shellacked' by a vote of no confidence. While he is likely retain his position as prime minister, the assumption is that he barely clinged on to his position and that the poor showing of his party's support puts Netanyahu in a difficult position of assembling a coalition for the long run. 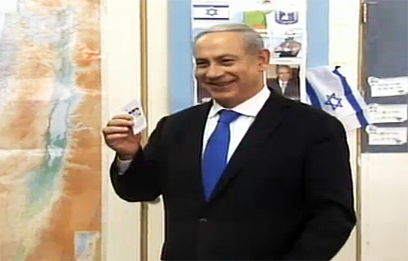 Based on the election results, the US administration and the peace camp may find a shed of light in seeing a much weaker Netanyahu than his 2nd term, but in reality the difficult challenges Netanyahu faces in forming a government based on the will of the Israeli public, may result in weakening the opposition from outside and an opportunity to form a stable coalition that will focus on internal issues that is at great concern. A survey conducted by the Maagar Institute for the newspaper 'BaSheva' found that a significant majority of Likud-Beitenu voters, 73%, prefer that Naftali Bennett join the new coalition compared to 27% who would like to see Tzipi Livni join. 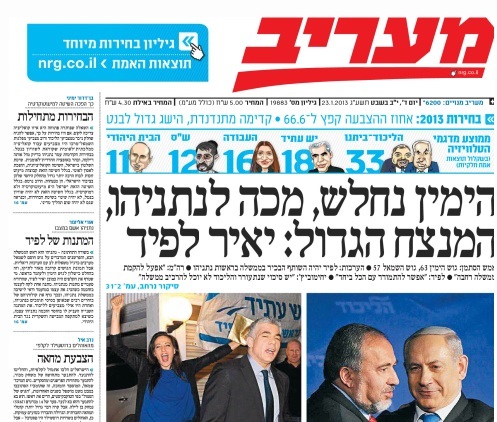 59% - are opposed to Livni joining the next coalition. 74% want to see a coalition that includes Jewish Home, Yesh Atid and the ultra-orthodox parties Shas and United Torah Judaism. Israel's Parliament will have its first American-born Knesset member since the late, Rabbi Meir Kahane who served as a Knesset Member in 1984. Maryland- native Dov Lipman is a member of the Yesh Atid party. In a post election statement, Lipman credited English-speaking voters with his victory, crediting the English debates that were sponsored by The Jerusalem Post for the rise in support for Yesh Atid. The Dome of the Rock Lives! Jeremy Gimpel and Hillel Horowitz wont be settling in the Knesset as members of the Parliament. The Likud Beitenu's negative campaign against Naftali Bennett's Bayit Yehudi party seemed to have stopped their rise on the expense of the Likud traditional base, while the undecided center-right voters flocked to Yair Lapid's sane and reasonable party. According to Channel 2's exit poll, half of Yesh Atid's voters came from the right, which resulted in Likud Beitenu's fall, and the dramatic shift to the center, one that our prediction couldn't project until the votes started coming in. The Bayit Yehudi definitely came a long way from the 7 seats they had in the previous Knesset, but to suggest that the party's 11 projected seats would serve as a third hand on the wheel, as Bennett promised defected Likud voters, seems to have been laid to rest. If anything, Lapid will have his hands on the gear, his feet on the brakes, while the Bayit Yehudi would sit seat-belted in the back of the car with the rest of Netanyahu's coalition partners. 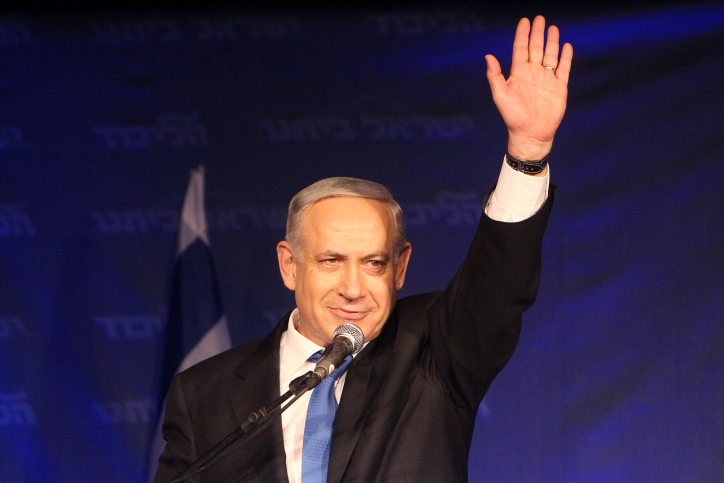 Prime Minister Benjamin Netanyahu emerged the bruised winner of Israel's Knesset election on Tuesday, Poised to serve as Israel's Prime Minister but losing ground to resurgent Right-Center parties, according to the exit polls. Likud Beitenu emerged as the largest party with 33 seats, 9 fewer than the 42 they held in the previous Knesset, according to Minah Tzemach's exit poll conducted for Channel 2 news. While votes are still counted, the projections showed Right-wing/Religious parties with a combined majority of 63 seats against 57 for the Center-Left-Arab bloc. 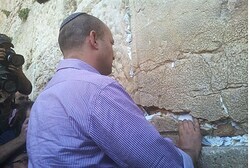 Naftali Bennett, head of the Jewish Home party, was verbally attacked by some Haredi worshipers at the Western Wall today, Arutz 7 reports. Jerusalem Police reportedly detained a Haredi Orthodox youth who called on Bennett to take off his kippah. The youth reportedly shouted "You want to draft our children to the army, mothers are crying at night," and "let me study Torah. Don't force me to go to the army, you're inciting sin."